Cocoa farmer James Kojo-Acquah was keen to share his story when UTZ visited his community earlier in the year. Clearly proud of his plantation, he told the story of how his life – and that of his family and community – has changed through the training and support he has received. 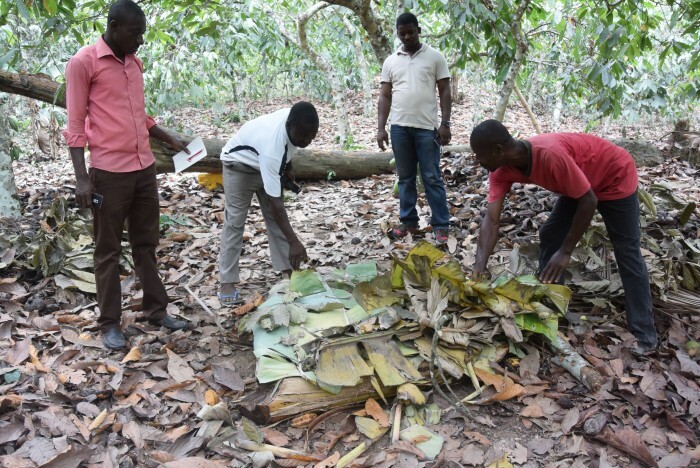 Cocoa farmer James Kojo Acquah is one of 89 members of Beyeden Anidaso Aba cooperative in Assin South, a district in Ghana’s Central Region. The name Beyeden Anidaso Aba means ‘hope has come to Beyeden village’, a sure sign of the difference that certification has made to the area. 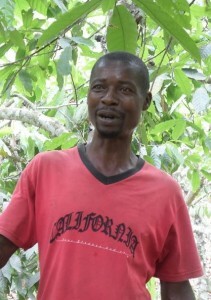 James, who is married with nine children, supports his family through growing cocoa on his 10-acre plantation. Before James became certified, he struggled to work out how to improve his crops. The area tends to suffer from droughts, and keeping plants irrigated and pest free was a big problem. There had never been any training available for farmers in the area, so when James heard he could attend UTZ-supported training sessions for free he jumped at the chance. James shows banana leaves with fermenting beans, an example of good agricultural practices. It’s made a massive difference to the way he runs his plantation, and to the quality and quantity of his crops. Before UTZ certification he produced seven bags of cocoa beans, now he produces between 20 and 25 bags. James’ tidy cocoa growing area, with only leaves on the ground. James is extremely proud of his well-maintained plantation, and a quick look around shows exactly why. It’s full of trees that are lush, well pruned and heavy with new small cocoa pods. 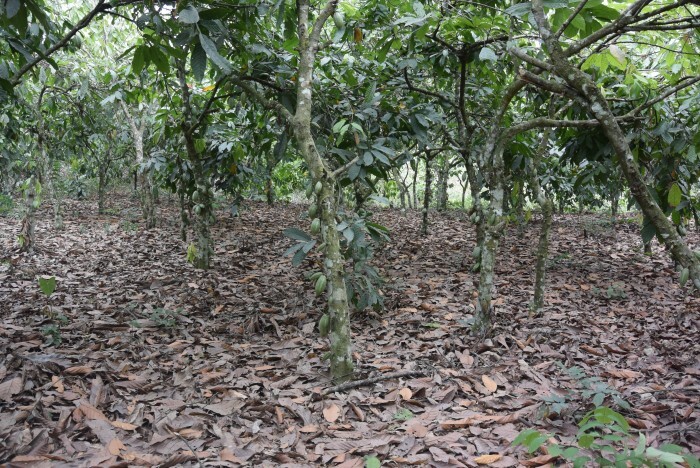 There are plenty of shade trees to protect the precious cocoa pods, and no weeds, bushes or branches on the ground. James’ trees have had a recent application of manure, and piles of cocoa shells going through the fermentation process are arranged in neat piles, to be turned every two days. Not all farmers in the area have signed up to certification, and the difference is tangible. In a neighboring plantation several trees have been cut down for wood, and the ground in between the cocoa trees has not been cleared. Trees here look dry with lots of yellow and brown leaves and unpruned branches. Most importantly, none of these trees are bearing any fruit. The healthiness of James’ plantation means an increased and steady income, which he is using to send his children to university. “Before I became certified all my children were attending primary school, even two of them had completed senior high school but I could not send them to any tertiary institution,” he says. Not only is James’ family benefiting, but his cooperative is able to reinvest part of the UTZ premium in wider community initiatives such as improving roads, water supply and education. There were no challenges. I am very happy I had the opportunity to be part of the cooperative, receiving training for free which has helped me to maximize my farm’s productivity. And it’s that productivity that will keep the family –and the cooperative – supported and able to further grow and develop over the years to come. Connecting directly to the farmers who grow the raw materials you buy creates transparency and credibility with your customers. We have many more farmer stories and quotes you can use to tell and back up your sustainability story. Contact us or visit the resource library to search our database. How useful is this article? Notify me of new comments. Holy Smoke! I only use Nestle semi sweet chocolate chips in my baking. My favorite candy is M& M peanut candy.And since I live in Delaware,I grew up eating Hershey kisses. I’m really happy to be helping all these people in other countries build a better future. My Dad was a farmer,and both my brother and I love to garden. Thank you so very much for all your efforts! 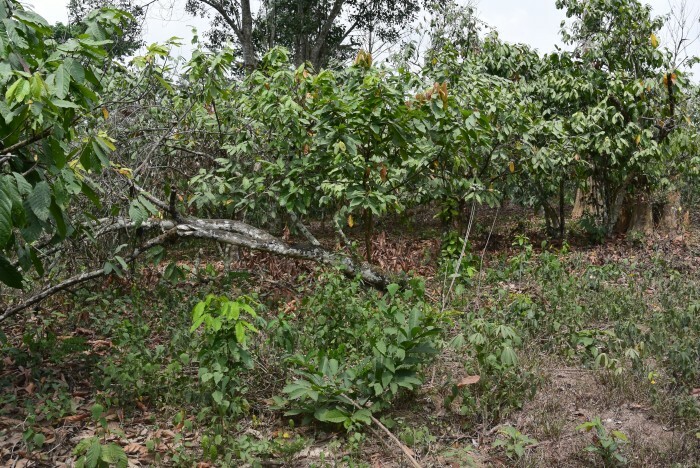 UTZ is a certification program for sustainable farming of coffee, tea, cocoa and hazelnuts. The program is part of the Rainforest Alliance, an international non-profit organization working to create a better future for people and nature. Stay ahead of the game! This website uses anonymized cookies that are necessary for the site to function as well as possible. Social media and marketing cookies are also used. If you want to make use of all these functionalities on the website, click on ‘Agree’. If you do not want to accept certain cookies, adjust your settings .